Performers at the Billboard Mexican Music Awards will include 3BallMTY, the group of young DJs that leads the finalists for the awards with nods in 12 categories. Regional Mexican stars Pepe Aguilar, Los Tucanes de Tijuana, Ana Barbara, Julion Alvarez y su Norteño Banda, and America Sierra, best known as the featured vocalist on 3BallMTY's single "Inténtalo", will also perform at the awards, to be broadcast live from Los Angeles' Shrine Auditorium on Telemundo Oct. 18. 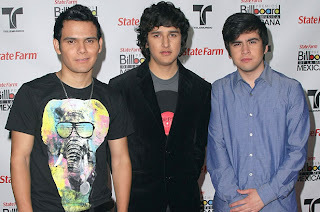 3BallMTY, who had their national television debut at last year's Mexican Music Awards, broke ground with "Inténtalo," a finalist in the Song of the Year, Song of the Year-Vocal Event and Duranguense/Grupero/Cumbia Song of the Year categories. Sales of the subsequent album of the same name, out on Fonovisa, helped make the group a finalist for Artist of the Year, Artist of the Year-New, Artist of the Year-Duo or Group, Albums Artist of the Year, Songs Artist of the Year, Digital Download Artist of the Year, and Duranguense/Grupero/Cumbia Artist of the Year. Sierra is up for five awards. Julión Alvarez, y Su Norteño Banda, another young act, is a finalist in six categories, including Artist of the year-Duo or Troup and Airplay Artist of the Year. Alvarez is also a finalist for Producer of the Year. Pepe Aguilar was recently immortalized on the Hollywood Walk of Fame, next to the one honoring his father, Antonio Aguilar. Aguilar debuted at the age of three in Madison Square Garden during one of his father's shows. With global sales exceeding 12 million albums, he has since reinvigorated the mariachi genre. Los Tucanes de Tijuana is the only Regional Mexican group that has simultaneously placed six titles in the Billboard Latin Albums chart. With songs written by only one composer, Mario Quintero Lara, they have sold more than 13 million albums worldwide over their 24-year career, earning 30 gold records and 27 platinum records as certified by the RIAA. After an eight-year break from recording, the Regional Mexican singer Ana Barbara, who rose to fame in Mexico in the mid-1990s, has made an impressive come back. Her latest single, "Tu Ingratitud," has been on the Billboard Regional Mexican Songs chart for 14 weeks. Sinaloa-born musician, composer, singer and rapper Smoky; Los Primos de Durango, the creators of the "Duranguense light" movement; and urban music sensation duo J-King y Maximan are also scheduled to perform at the Billboard Mexican Music Awards.